This quick and easy, seasonal warm salad can be on the table in just 25 minutes. 1. 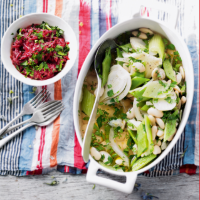 Place the fennel, celery and runner beans into a large frying pan and pour over the stock. Bring to the boil and cook for 10 minutes until tender, adding the butter beans for the last 2 minutes. Remove the vegetables with a slotted spoon, mix in half the parsley and place in a serving dish. Boil the remaining stock to reduce by half and pour over the vegetables. 2. Meanwhile, mix the beetroot with the balsamic glaze, yogurt and remaining parsley, then season and serve with the braised vegetables. This recipe was first published in Thu Jul 10 09:37:00 BST 2014.